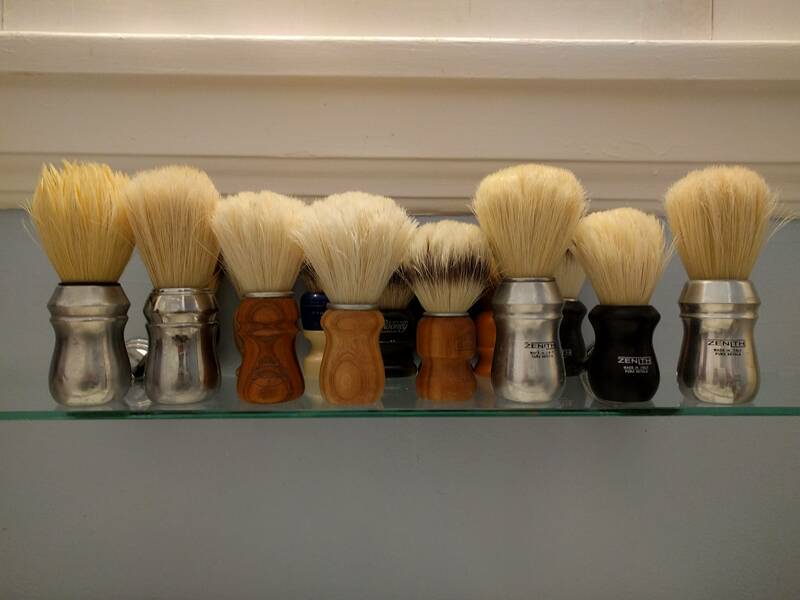 What is your Favourite Boar Brush? 1. Semogue 1305 - I love this brush, it softens nicely with soaking and lathers well. I've seen complaints about the painted handle chipping but so far mine is fine - I wonder if the handle chippers might be particularly exuberant latherers and may knock the handle against the sides of their scuttles or agains the sink when rinsing? I think if you fall into this camp you might want to avoid the painted handles. 3. Omega 10049 - this one is a bruiser being in Omega's Pro series it has a bigger, longer knot and performs really well. Some find it a tad floppy but I think its pretty darn good. Lathers very well and gives a gentle exfoliation. I'll be keeping this in the stable for the duration, a trooper. 4. 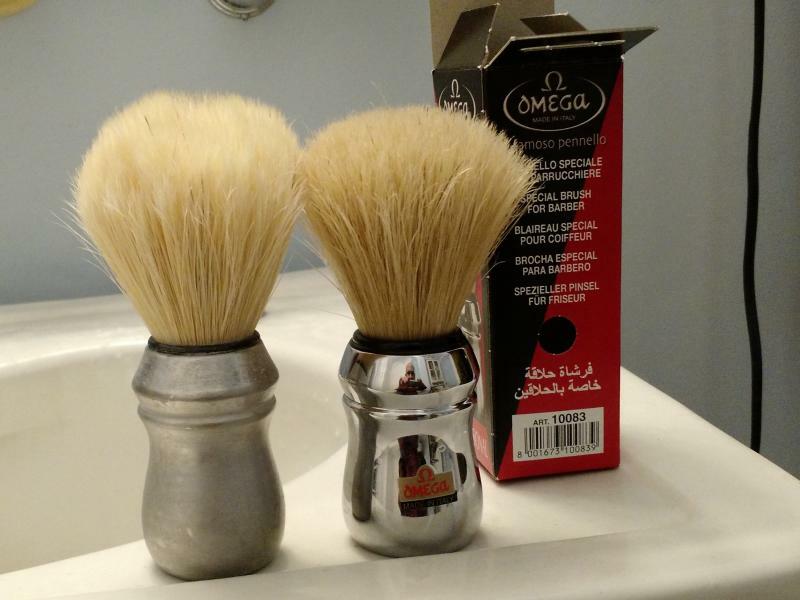 Omega no number - I picked up a $10 omega boar at the drug store and it has no model number but the same beechwood handle as several Omega brushes - its a surprisingly good performer as well. I bought this one purely as a test because it was the brush that I had based my original (wrong) impression of boar brushes on so I got another one to see how it would work when treated properly. You really could get by with only this brush in your arsenal and it wouldn't be a hardship. Very nice indeed. 5. RazoRock Blondie Boar - I really liked this brush. It broke in quickly and was able to produce a profusion of lather, however, I've retired it for the time being because it continued to lose bristles well beyond the point where the initial few loose bristles would be expected to be shed. I have some trouble with my sink drain and I find that boar bristles, synthetic and badger can contribute to some pretty stubborn clogs. Retiring this brush hurt me because it was a great brush and it was really reasonably priced and I do like a bargain. 6. Omega S10005 S-Brush - synthetic boar bristles, I'm just getting to know this brush and I do find it a little soft, however, I've heard so many good things about it that I will persevere and get to know it well before I decide whether I like it or not. The Proraso version of the 48 is a really nice brush available for a shoe string too. Just slightly lower loft. A ) Semogue 2000: This is one that I don't hear much about anymore but I love it. It is a big brush by Semogue standards. Unfortunately, like the 1305, the painted handle does, indeed, chip badly. In fact, I could have returned mine for a free replacement when the handles were supposed to have been made better but I opted not to because the bristles on mine had broken in so beautifully. While the handle looks bad, I have never regretted the decision to keep the brush; it's simply amazing. B) Semogue 1305: This was my very first boar and, to be sure, the paint job has seen better days. However, it was this brush that let me know just how wonderful boars can be. C) Omega 10049 Professional: What can I say about this brush that you already haven't, Mark? A keeper for sure. D) Semogue Owners Club with a blond wood handle: Another lovely boar with a fantastic handle. For some reason this and my 2009 Semogue Owners Club Cherry Wood L.E. don't get nearly the face time that they deserve. Both are excellent. E) 2009 Semogue Owners Club Cherry Wood L.E. : As mentioned above, a fine all-around brush that just isn't being used that much, though it is not out of my rotation. F) Omega 10098 Profedssional: This brush, sometimes called The Paintbrush because of its handle shape, is big and is great for doing paintbrush application of lather to the face. Most appropriate. G) Semogue 830: A fine brush that I like using on my few triple milled soaps. What I like about this brush is the feel and look of the handle. Freddy thats a good selection of boars you have there. I agree with you, notwithstanding listing the brushes numerically I pretty much love them all equally. I note that you have a Semogue 830 and like it - what got me going off on boar brushes generally and Semogue specifically was a recent trashing (literally) of the Semogue 830 by a noted shaving blogger. Apparently he's had no luck generating a lather with it after numerous attempts. Several other posters weighed in against the 830 as well and they ultimately decided that all Semogue brushes were inferior. I couldn't understand it as I've had great experiences with all of the Semogue brushes I have. Great performance from the get go that improves over time and a fantastic face feel. I just can't say enough about how much I enjoy these brushes and they're very reasonably priced to boot. Oh well, YMMV right? I've really been enjoying my 28mm Zenith aluminum handled boar lately. Its gigantic and really soft after soaking. The handle is a nice comfortable shape as well. All I have to compare it to though is the small Omega I got with my first starter kit. It's a decent little brush in its own right. I would eventually like to have a Semogue boar too though. Why not right? Omega Pro #48 or #49 are just lovely, although I don't use them or other boar brushes, very much. I am a 2-Band badger-kind-of-guy. (03-24-2016, 03:50 AM)wyze0ne Wrote: I've really been enjoying my 28mm Zenith aluminum handled boar lately. Its gigantic and really soft after soaking. The handle is a nice comfortable shape as well. All I have to compare it to though is the small Omega I got with my first starter kit. It's a decent little brush in its own right. I would eventually like to have a Semogue boar too though. Why not right? Thanks for reminding me of the Zenith Jeff, it had completely slipped my mind. I'm going to take a look at that one. celestino i do enjoy my badgers as well, completely different feel than the boars. I guess I like the variety of mixing it up. Years ago, the logo wore off and when I went looking for another, I assumed it was an Omega. I bought an Omega 83 thinking that it was the same brush, but quickly realized it wasn't : the bristles were coarser and less dense. I then went on a boar buying spree and picked up an Omega 48, Semogue 2000, SOC, and a used 2013 Barbear Classico Cerda. I liked each brush, but none were as nice as my well worn old aluminum brush. Of the Semogues, the Barbear Classico is my favorite, followed by my 2000 then the SOC. I find the 2000 and SOC to be a tad floppy and don't use them regularly. The Classico is just a great scrubby brush, and still gets regular use. In my searches, I came across Zenith and when I figured out my old brush is a Zenith, I started to import them. I've also added a 26 x 57 aluminum (pictured above on right next to my old brush after being polished), a 28 x 50 (Big scrubby) and 24 x 48 short scrubby with a wood handle. The short scrubby gets a surprising amount of use. I find the shape of the handle comfortable and it's a great brush for when I'm running late. I had it specially made to replicate the feel of the Barbear classico. It's not as scrubby though. I don't think I can get anything that scrubby with the thinner bristles that Zenith uses. My first Zenith is still my favorite. The way it's broken in over the years is just amazing. It's always lost a few hairs each shave though. The flip side of using the thinner bristles is that they are more vulnerable to breaking off. 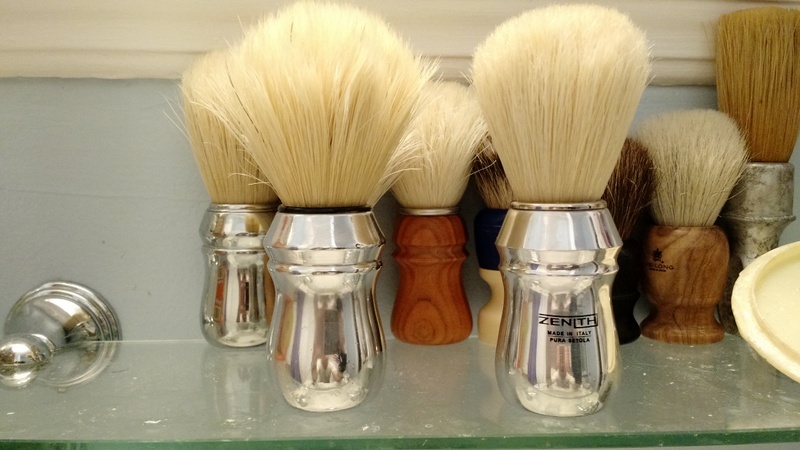 Original Zenith, Omega 48, SOC, Semogue 2000, Barbear Classico, Zenith 26 x 57, 24 x 48, 26 x 50. BTW the Razorock boars are made by Zenith. jankdc those are beautiful brushes. I can feel that familiar itch, must have.....more......brushes . Among the many great features that boar brushes share is the relatively reasonable price. I'm going to be checking out your eBay shop. jankdc, great collection of brushes!